Prostate cancer (CaP) remains a significant medical problem in western countries and accounts for estimated 161,360 new cases and 26,730 deaths in the USA in 2017 . Around 70% of CaP patients present with organ-confined disease, with the majority presenting with low- or intermediate-risk CaP . At the early stage, patients can be treated effectively with surgery with or without radiotherapy (RT). RT is an important treatment option for CaP patients with early-stage or advanced-stage disease. RT, through ionizing radiation (IR), damages cancer cells by producing intermediate ions and free radicals at various levels, particularly but not only on the DNA, causing DNA single-strand breaks (SSBs) or double-strand breaks (DSBs), triggering a number of signalling pathways mediating the DNA damage response (DDR). DDR is the determining factor of the therapeutic effect, during which the most relevant processes are DSB repair pathways including homologous recombination (HR) and non-homologous end-joining (NHEJ) pathways . In CaP clinical settings, RT is an effective therapeutic modality for clinically localized CaP. Common RT modalities include external beam radiation therapy (EBRT) and radioactive isotopes as used in brachytherapy. Over the several past decades, there has been a rapid advancement in the treatment of CaP with EBRT. The previous standard RT was 3-dimensional (3D) conformal radiation therapy (3D-CRT), where multiple shaped radiation beams were used to limit dose to adjacent tissues rather than the prostate . Later, intensity modulated radiation therapy (IMRT) for CaP was introduced in the mid-1990s, which creates dynamic fields that vary in intensity across their cross section, providing a more close conformity to a specific tumor region . In addition, proton beam radiation and carbon ion RT offer superior dose conformity in the treatment of deep-seated malignant tumors compared with conventional X-ray therapy [6, 7]. The long-term results of proton beam radiation yield comparable disease-free survival to alternative treatments for localized CaP with minimal morbidity . Moreover, excellent outcomes for biochemical relapse-free survival were obtained from carbon ion RT in high-risk CaP compared with the photon or proton radiation . Several phase III trials for localized CaP patients have shown the benefit of dose escalation with the high-dose conformal RT with conventional 2 Gy daily fractions to a total dose of 74 Gy [10, 11]. However, it was found that the high-dose RT (74-80 Gy) is associated with an increased risk of late grade 2 or higher gastrointestinal toxicity compared with lower doses of RT (64-70.2 Gy) . Hypofractionated RT is the delivery of fewer and larger fractions of radiation. The recent randomised, phase III CHHiP trial recommended hypofractionated RT as a new standard therapy of EBRT for localized CaP, which may improve the therapeutic ratio, resource usage and patient convenience . Despite advances in the approaches of delivering radiation to the prostate gland of CaP patients, failure to control a tumor with a curative dosage is a major problem in RT which eventually occurs in almost one-third of CaP patients . The relapse after RT can be attributed to many factors such as geographic miss, changes in the target volume, disseminated tumor cells (occult metastases) and micro-metastases at the time of diagnosis, and most importantly, radioresistance of tumor cells . Radioresistance may arise from many biological processes including mutations of oncogenes and/or tumor suppressors, deregulated signalling pathways, abnormal DDR, as well as disordered cell death and cell cycle checkpoint . During the past decades, considerable efforts have been put into the investigation of these contributing factors. However, direct manipulation of coding genes and essential signalling pathways in vivo are difficult due to technical issues on stable gene delivery and expression, as well as diverse crosstalk among different signalling pathways, and altering coding genes often causes substantial toxicity and side effects. MicroRNAs (miRNAs) are a class of endogenous, small non-coding RNAs composed of ~22 nucleotides. They play an important role in the regulation of gene expression at the post-transcriptional level by targeting mRNAs, whereby modulating various processes including cell growth, differentiation, cell cycle and cell death . As inherent gene regulators, miRNAs could offer new predictive and therapeutic possibilities. It was not until recent years have miRNAs been recognized as an important regulator of radiation response. Accumulating evidence has shown that there is a close link between miRNA expression and radioresistance in cancers [18, 19, 20, 21, 22, 23]. Nevertheless, the number of studies on the regulatory mechanisms of miRNA in CaP radioresistance is very limited and the understanding of the functional role exerted by individual miRNAs in CaP radioresistance is largely in their infancy and requires a great number of further studies. 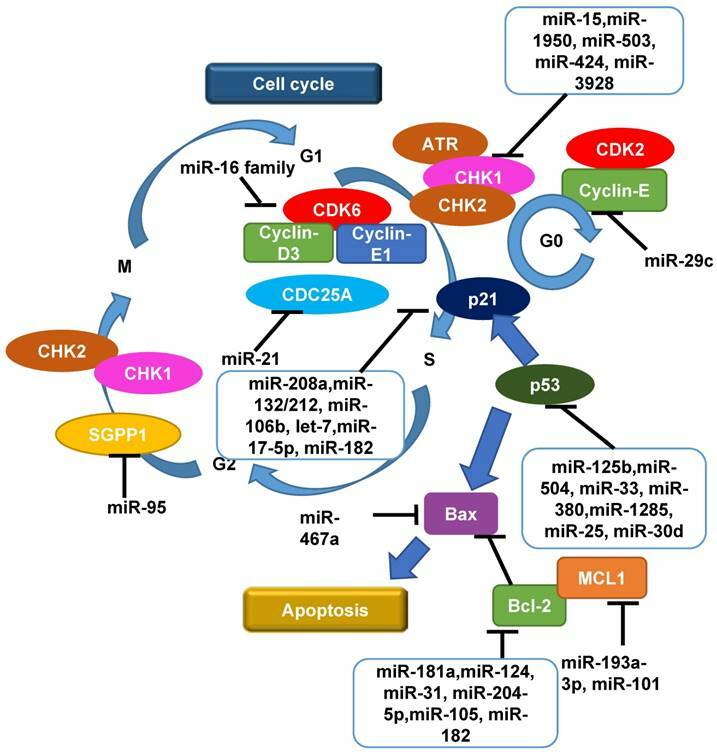 In this review, we summarize the roles of miRNA in CaP, elaborate on miRNAs in CaP radiation response, discuss the putative roles of miRNA-related signalling pathways and biological processes in various cancers including CaP, and finally emphasize its potentials as predictive biomarkers and therapeutic targets in CaP RT. It becomes increasingly evident that miRNAs function as a negative regulator of gene expressions by binding to complementary mRNAs, resulting in translational repression and mRNA degradation. As such, dysfunction of miRNAs is known to disrupt the expression of mRNAs and proteins, and has been found to be involved in various human cancers, including CaP . It was found that about 26% (12 out of 47) long-range epigenetic silencing contained miRNA genes in 4 CaP cell lines (LNCaP, DU145, PC3 and MDA-2A) . As there are more than 2000 unique human miRNAs in the miRNAnome (miRbase.org) with hundreds of predicted targets individually, their role in CaP carcinogenesis and therapeutic resistance is widespread and remains elusive. A recent review has demonstrated that there are 30 miRNA studies associated with CaP diagnosis and another over 30 miRNA studies related with CaP prognosis . In one study, Volinia et al. identified 39 up-regulated miRNAs and 6 down-regulated miRNAs out of 45 human CaP primary tumor samples compared with normal prostate tissues from a miRnome analysis . In another study, Porkka et al. detected differential expression of 51 individual miRNAs between benign prostatic hyperplasia (BPH) and CaP tissues, 37 of them showing down-regulation and 14 up-regulation in CaP samples . Sun et al. demonstrated that up-regulation of miR-221 reprogrammed androgen receptor (AR) signalling and promoted the transition to castration-resistant CaP (CRPC) . More recently, the tumor-suppressive miR-221/222 cluster was identified in one study demonstrating the down-regulation of miR-221/222 cluster enhanced migration and invasion in CaP cells which led to CRPC . The differences from various studies imply that the regulatory role of miRNAs in CaP carcinogenesis and progression is still inconclusive, with the explanation being the complexity of miRNAnome and diversity of mRNA targets for each miRNA. Also, the genetic and microenvironmental tumor heterogeneity may confound the identification of miRNA expression patterns . Despite the conflicting results, miRNAs have been proved as a biomarker for prognosis of CaP in several studies. Guan et al. found the up-regulation of miR-21 as an independent predictor of progression-free survival (PFS) in patients with advanced CaP . Spahn et al. demonstrated that down-regulation of miR-221 was associated with clinicopathological parameters, including the Gleason score and the clinical recurrence during follow-up in 92 CaP patients . Introduction of ectopic miR-145 in 22Rv1 CaP cells generated an inhibitory effect on the AR at both transcript and protein levels as well as its activity and downstream targets PSA, hence reduce the transformation to the deadly CRPC . In addition, it was reported that CaP patients with post-surgery biochemical relapse displayed a distinct expression profile of 16 miRNAs in formalin-fixed paraffin-embedded prostatectomy specimens, as compared with non-relapsed patients , indicating that aberrant miRNA expression features may reflect a tendency for early disease relapse. Similarly, miR-145 expression was found to be significantly increased in patients demonstrating good response (PSA<2.0ng/mL/year) to neoadjuvant RT, while the expression of miR-145-regulated γ-H2AX gene was significantly decreased . Moreover, up-regulated miR-135b, miR-194, miR-222 and miR-125b were observed to predict the risk of early recurrence in CaP [34, 36]. Several different studies in evaluating the expression of specific miRNAs in CaP tissue samples indicated that the expression levels of miRNAs including miR-205 [37, 38], miR-224 [39, 40], miR-21 , miR-126 , miR-34b  and miR-15/16  are progressively deregulated in lymph node or bone metastases and correlated with clinical outcome, thus supporting a possible role of these miRNAs as prognostic biomarkers and novel therapeutic targets . Taken together, altered miRNA expression is highly prevalent in CaP and miRNA expression profiles have been found to be closely correlated with unique pathophysiological features in CaP, which still requires rigorous biological and statistical validation in addition to a clear definition of applicable target populations. Elucidation of differentially expressed miRNAs presents an attractive avenue toward the development of novel CaP prognostic indicators and therapeutic targets. One of the approaches in defining the changes of miRNAs in response to IR is to determine which one exhibits significant changes after IR compared with controls [20, 46, 47]. Accumulating evidence demonstrates that exposure to IR can significantly alter miRNA expression levels in cancer cells including CaP [48, 49]. Leung et al. exposed PC-3 CaP cells to different dose levels of radiation and identified 6 increased miRNAs (miR-9, miR-22, miR-25, miR-30a, miR-550a and miR-548h) and 16 decreased miRNAs (let-7c/d/e, miR-15a, miR-17, miR-30d, miR-92a, miR-125a, miR-197, miR-221, miR-320b, miR-342, miR-361, miR-374a, miR-501 and miR-671) compared with the parental cells . MiR-106b is one of the 3 highly conserved miRNAs within the miR-106b-25 cluster located in a 515-bp region at chromosome 7q22, in intron 13 of the host gene MCM7 . The members of the cluster are co-transcribed in the context of the primary transcript of MCM7, the over-expression of which has been associated with worse prognosis in CaP . Expression of miR-106b was found to be decreased by 3.3-fold 24 hours post-radiation in LNCaP CaP cells compared with untreated parental cells , indicating that miR-106b expression is modulated by IR. MiR-449a is the best-characterized member of the miR-449 family (miR-449a, miR-449b and miR-449c), deregulated in various types of cancers including CaP [54, 55]. Mao et al. found that miR-449a was markedly up-regulated in LNCaP cells following IR and its expression reached the maximum level 24 hours post-IR with 4 Gy X-ray, and overexpression of miR-449a enhanced radiosensitivity by down-regulating c-Myc in LNCaP CaP cells , suggesting its important role in CaP radioresistance. MiR-521 was also found to be significantly altered in response to radiation treatment in CaP . It was demonstrated that overexpression of miR-521 significantly sensitized LNCaP and C4-2 CaP cells to RT while ectopic inhibition of miR-521 resulted in radioresistance . Further study indicated that miR-521 modulates radiosensitivity through Cockayne syndrome protein A (CSA) (a DNA repair protein) and the levels of miR-521 are correlated inversely with the levels of CSA . let-7 was initially found as the second miRNA after lin-4 in Caenorhabditis elegans . The human let-7 family consists of let-7a, let-7b, let-7c, let-7d, let-7e, let-7f, let-7g, let-7i and miR-98. This family is commonly viewed as a tumor suppressor consistent with down-regulation of oncogenes such as Ras  and c-Myc  by binding to 3'-UTR of these target mRNAs. Moreover, decreased let-7 expression was found in many cancers, including CaP . John-Aryankalayil et al. compared miRNA expression in LNCaP, PC-3 and DU145 CaP cells treated with the single-dose radiation in the same CaP cells treated with fractionated radiation by microarray, and found that fractionated radiation significantly altered more miRNAs as compared to single-dose radiation . Moreover, tumor suppressor miR-34a and let-7 were found to be up-regulated by fractionated radiation in radiosensitive LNCaP (p53-positive) and PC-3 (p53-null) cells, indicating that radiation-induced miRNA expression may not be regulated by one factor (p53) alone, but potentially by multiple pathways, which will be discussed in detail next. Using a global analysis and a miRNA PCR array data analysis, our group found that the expressions of miR-200 family (miR-200a/b/c, miR-141 and miR-429), miR-4474, miR-7641 and miR-4521 are repressed in CaP-radioresistant (RR) cell lines compared to CaP-radiosensitive cell lines (unpublished data), suggesting these miRNAs are involved in CaP radioresistance. The miRNA expressions altered by IR in CaP are summarized in Table 1. It is worth mentioning that, in many cases, miRNAs changes reported in one study were not highlighted in another one, indicating the changes are not consistent or common. This observation suggests that other potential targets may exist and other conflicting factors need to be further elucidated. To the best of our knowledge, the changes of miRNA profile induced by IR in CaP are only limited in in vitro cell line studies. Therefore, the study of miRNA changes after IR from animal models or human samples are needed to deeply investigate its roles in CaP radiation response or radioresistance in the future. The PI3K/Akt/mTOR signalling pathway is implicated in a diverse array of cellular functions including survival, growth, proliferation, differentiation, stem cell-like properties, metabolism and angiogenesis . This pathway is closely associated with 3 major radiation resistance mechanisms including intrinsic radiosensitivity, tumor cell proliferation ability and hypoxia microenvironment  and is regulated by several miRNAs at different levels. A key downstream molecule in this pathway, Akt, is directly mediated by miRNA regulation. Evidence showed that miR-302a sensitized radioresistant breast cancer cells to radiation therapy in vitro and in vivo and reduced the expression of Akt1 , providing a rationale for investigating the role of this miRNA in CaP cell survival and cell signalling after RT. The suppression of radiation-induced Akt activation was also observed in U373 malignant glioma cells as a consequence of miR-21 silencing by synthetic inhibitors . Notes: ↑, increased; ↓, decreased; RR, radioresistant. The PI3K/Akt/mTOR signalling pathway was mediated by phosphatase and tensin homolog (PTEN), a negative regulator of Akt expression. It was reported increased miR-21 was induced after IR, facilitating the repression of PTEN and the activation of Akt to promote the DNA damage repair and cell survival in U251 glioblastoma cell line , and several articles have demonstrated sensitisation to IR by antagonising miR-21, ultimately inhibited the PI3K/Akt pathway in malignant glioma cell lines  and esophageal cancer cell lines , suggesting it is worthwhile testing miR-21 in CaP-RR cells. Similarly, miR-205 and miR-221/222 were found to regulate radiosensitivity via direct modulation of PTEN in gastric  and nasopharyngeal  cancers. In CaP, it was found that siRNA-mediated knockdown of SGPP1 ugregulated phospho-Akt levels in PC-3 CaP cells and conferred increased radiation resistance in PC-3 and DU145 CaP cells, phenocopying that seen in miR-95-overexpressing PC-3 and DU145 CaP cell lines . However, the direct link between miRNAs and the PI3K/Akt signalling pathway in CaP radioresistance has not been reported so far. It will be of great interest to investigate the role of miRNAs in the regulation of the PI3K/Akt pathway in the future study. Targeting miRNAs to repress the PI3K/Akt signalling pathway may become a valid approach to treating CaP and overcoming radioresistance. The MAPK pathway was demonstrated to be associated with growth factor-mediated regulation of cellular events such as proliferation, differentiation and apoptosis . Particularly, the MAPK/ERK pathway, also known as the 'classical' MAPK pathway, is closely related with IR. After stimulating EGFR family receptors by radiation, the MAPK pathway activates the downstream protein Ras, leading to translocation of the RAF proteins to the plasma membrane. The active form of RAF, RAF-1, phosphorylates MAPK kinase 1/2 (MEK1/2), which subsequently phosphorylates extracellular signal-regulated kinase 1/2 (ERK1/2), altering transcription factor function and the apoptotic threshold of cells . The RAF/MEK/ERK pathway is critical for efficient DNA damage repair . Similar to the PI3K/Akt pathway, the MAPK pathway has a number of miRNA regulators. Members of the let-7 family were reported to down-regulate the expression of K-Ras (a protein in Ras family) and the overexpression of let-7a decreased expression of K-Ras and radiosensitized A549 lung carcinoma cells . Another study also demonstrated that overexpression of let-7 family increased the cellular radiation response, whereas decreasing their levels causes radioresistance, partly through control of the proto-oncogene homologue let-60/Ras and genes in the DNA damage response pathway in A549 lung cancer cells in vitro and in a Caenorhabditis el egans model in vivo . These two studies indicate that let-7 plays an important role in the Ras protein and radiation response in lung cancer cells. MiR-17-5p is usually overexpressed and acts as an oncomiR in tumor to effectively activate the p38 MAPK pathway and elevate the phosphorylation level of heat shock protein 27 (hsp27) . The p38-MAPK pathway was found to play a role in the phosphorylation of hsp27 induced by miR-17-5p, promoting tumor invasion and metastasis in Huh-7 and HepG2 hepatocellular carcinoma cells in vitro and in vivo . Hence, regulating the expression of miR-17-5p and interfering its interaction with the MAPK/ERK signalling pathway may have potential to exploit the possible mechanisms of radioresistance and improve CaP radiation response. DDR is an essential process during IR, which can maintain genome integrity in cells by reversing the exogenous and endogenous DNA damage and is indispensable in cell survival during DNA replication . Cells have evolved high conservative yet diverse DDR pathways, which contain three major components: sensors, signal transducers and effectors. Initial step after damage by IR includes DNA damage sensing and cell cycle checkpoint activation. SSB sensing is often performed by poly [ADP-ribose] polymerase-1 (PARP-1) while the sensing of DSB, the more common form of IR-induced damage, is conducted by MRN complex (MRE11/RAD50/NBS1). Up to date, there are no validated miRNAs that target PARP-1 or the MRN complex. At the level of transducers, ATM and ATR (ATM-Rad3-related) are proximal kinases in the central of the entire DDR and can be used to detect various forms of damaged DNA and trigger the downstream DDR cascades . ATR generally responds to SSBs while ATM is the main activator of the DDR after DSBs. As DSB is the more common form of IR-induced damage, the miRNA regulation of ATM will be discussed in detail. ATM is directly regulated by several miRNAs in tumor cells, including miR-18a in colorectal cancer , miR-26a in glioblastoma , miR-100 in glioma , miR-101 in lung cancer and glioblastoma , miR-223 in glioblastoma  and miR-421 in neuroblastoma . In particular, Hu et al. discovered that miR-421 suppressed ATM expression by targeting the 3'-UTR of ATM transcripts in LA-N-1 and LA-N-5 neuroblastoma cells in vitro . Ectopic expression of miR-421 resulted in S-phase cell cycle checkpoint changes and sensitised LA-N-1 and LA-N-5 neuroblastoma cells to IR, and blocking the interaction between miR-421 and ATM 3'-UTR rescued the defective phenotype caused by miR-421 overexpression, indicating that ATM mediates the effect of miR-421 on cell cycle checkpoint and radiosensitivity . The findings from Hu et al. 's study were supported by another study in which miR-421 was found to be able to induce clinical-manifested radiosensitivity in SKX head and neck squamous cell carcinoma in vitro , further confirming the putative role of miR-421 in the regulation of ATM and radiation response. ATM is responsible for the phosphorylation of several downstream effectors, including histone H2AX, a mediator of DSB repair that recruits DNA repair proteins to the site of damage. MiR-138 was found to directly target the histone H2AX 3'-UTR, reduce histone H2AX expression, and induce chromosomal instability after DNA damage in U2OS osteosarcoma cell line . Overexpression of miR-138 in U2OS osteosarcoma cell line inhibited HR pathway and enhanced cellular sensitivity to IR, causing increased chromosomal instability after DNA damage . DNA-dependent protein kinase (DNA-PK) is another important effector in the DDR (NHEJ pathway). Yan et al. demonstrated that miR-101 could target the 3′ -UTR regions of DNA-PK and ATM mRNA, and up-regulating miR-101 efficiently reduced the protein levels of DNA-PKcs and ATM in U87MGD malignant glioma cells and 95C lung cancer cells, sensitizing the tumor cells to IR in vitro and in vivo . Apart from ATM and DNA-PK, BRCA1 and BRCA2 are also important tumor suppressor genes. A recent genomic analysis revealed that inactivating mutations in BRCA1 or BRCA2 or other genes involved in the HR pathway of DNA repair collectively occur in as much as 20-25% of advanced CaP , indicating that BRCA1 and BRCA2 play an essential role in DNA damage repair pathways, specifically the HR pathway. A synthetic lethal therapeutic approach using PARP inhibitor has been developed for BRCA mutant- and HR deficient-related cancers including metastatic CRPC and is being investigated in multiple Phase I and Phase II clinical trials (NCT01972217, NCT02861573 and NCT01682772). Chang et al. found that BRCA1 epigenetically represses miR-155 expression via its association with HDAC2, which deacetylates histones H2A and H3 on the miR-155 promoter , and overexpression of miR-155 accelerated but the knockdown of miR-155 attenuated the growth of MDA-MB-468 breast cancer cells in vivo , suggesting that miR-155 may have the potential to treat BRCA1-associated CaP by regulating DDR and increase radiosensitivity. It was also found that the transcripts of HR factors including BRCA1, BRCA2 and RAD51 can be targeted by miR-1255b, miR-148b* and miR-193b*, and inhibiting these miRNAs increased expression of BRCA1/BRCA2/RAD51, specifically in the G1-phase, which blocked NHEJ impairing DSB repair in MDA-MB-231 breast cancer cell line in vitro . A recent study showed that two potent IR sensitizing miRNAs (miR-890 and miR-744-3p) significantly delayed IR-induced DNA damage repair in CaP. In this study, miR-890 directly targeted MAD2L2, as well as WEE1 and XPC, whereas miR-744-3p directly targeted RAD23B . The putative regulatory roles of miRNAs in DDR in CaP radioresistance are shown in Figure 1. Taken together, it is tempting to say that investigation of regulatory mechanisms between miRNA and DDR genes will possibly lead to the discovery of novel and promising targets to overcome CaP radioresistance. The eukaryotic cell cycle consists of four phases and transition from one to the other is regulated by Cyclins and Cyclin-dependent kinases (CDKs). Following the induction of DNA damage, cell cycle checkpoints are triggered to interrupt cell cycle progression to allow time for DNA damage repair by targeting the Cyclin/CDKs complexes that normally promote cell cycle progression. Once the damage is repaired, cells will re-enter the cell cycle; if the damage is too broad or severe, cells will go on to apoptosis or senescence . Cell cycle checkpoint activation is pivotal for safeguarding genomic stability. Otherwise, there will be an increasing rate of genomic instability, resulting in tumorigenesis. The cell has two main checkpoints to maintain genomic stability throughout the cell cycle; one at the G1/S interphase and the other at the G2/M interphase, which is thought to be able to prevent cells from replication or undergoing mitosis, respectively, in the presence of DNA damage . Interfering the cell cycle process contributes to the tumor radiation response . At the G1/S checkpoint, multiple miRNAs regulate Cyclins and CDKs. It was reported that miR-29c was found to be frequently down-regulated in 5 esophageal squamous cell carcinoma cell lines (KYSE150, KYSE410, KYSE450, KYSE510 and EC9706) in vitro and 60 advanced human esophageal squamous cell carcinoma tissue samples . Overexpression of miR-29c suppressed EC9706 and KYSE150 esophageal squamous cell carcinoma cell growth in vitro by inducing cell cycle G1/G0 arrest mainly through modulating Cyclin-E expression . Another report showed that the miR-16 family triggers an accumulation of A549 lung carcinoma cells in G1 arrest by silencing multiple cell cycle genes including Cyclin-D3, Cyclin-E1 and CDK6 simultaneously . These studies support a key role of miRNAs in regulating the cell cycle. CHK1 and CHK2 are the two most common cell cycle checkpoint proteins and both of them were found to be activated in CaP-RR cells . Recent results suggested that a post-transcriptional regulation mechanism, involving miR-195 and miR-503, was inversely correlated with expression of CHK1 in RR AGS and MKN45 gastric cancer cells . Another report also showed that expression of the miR-15 family contributes to increased radiosensitivity of MCF-7 and MDA-MB-231 breast cancer cells by targeting 3'-UTR of CHK1 . MiR-3928 was shown to bind directly to the 3'-UTR of Dicer mRNA, which consequently induced DNA damage, activated ATR, and phosphorylated CHK1 accompanied by G1 arrest in response to IR in HeLa cervical carcinoma cells and 786-O renal cell carcinoma cells . Xu et al. reported that enforced expression of miR-424 inhibited the growth of SiHa and CaSki cervical cancer cells by both enhancing apoptosis and blocking G1/S transition, as well as suppressing the expression of CHK1 and phosphorylated CHK1 by targeting the 3'-UTR of CHK1, which implies that miR-424 functions as a tumor suppressor and cell cycle checkpoint regulator in cancer progression . An overview of roles of miRNAs as a regulator of DDR in response to radiation in cancers. When SSB or DSB occurs, DNA damage repair pathway is initiated. 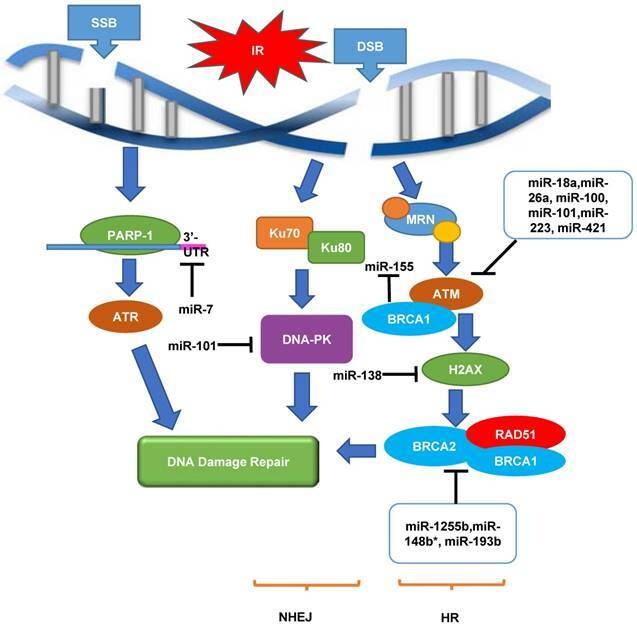 This pathway contains a cascade of components including sensors (MRN and PAPR-1), transducers (ATM and ATR) and effectors (DNA-PK, RAD51 and BRCA1/2), in order to achieve DNA damage repair through NHEJ and HR pathways. Multiple miRNAs play important roles in up-regulating or down-regulating these biological processes in cancer radiation response. ATM, ataxia telangiectasia mutated; ATR, ataxia telangiectasia and Rad3-related protein; DNA-PK, DNA-dependent protein kinase; DSB, double-strand breaks; HR, homologous recombination; IR, irradiation; MRN, MRE11/RAD50/NBS1; NHEJ, non-homologous end joining; PARP-1, Poly [ADP-ribose] polymerase 1; SSB, single-strand breaks. '⊣' indicates down-regulation and '⟶' indicates up-regulation. CDC25A is a phosphatase serving as another cell cycle checkpoint effector that plays an important role in checkpoints by activating CDKs to lift the checkpoint arrest. CDC25A is a direct target of miR-21 in colon cancer , let-7 in lung cancer  and miR-449a/b in osteosarcoma  in DDR. In particular, Wang et al. identified that, in RKO and DLD1 colon cancer cell lines, miR-21 suppressed CDC25A expression through a defined sequence in its 3'-UTR, and miR-21 was induced by DNA damage, negatively regulates G1/S transition and participates in DNA damage-induced G2/M checkpoint through down-regulation of CDC25A . Li et al. found that miR-21 expression was up-regulated in response to IR in U251 glioblastoma cells, suggesting that miR-21 could be involved in the response of glioblastoma cancer cells to radiation and used as a biomarker to predict RT response . While the cell cycle arrest driven by CDC25A is transient, the more long-term arrest effect is achieved by p53. The p53-dependent G1/S checkpoint not only functions to permanently arrest damaged cells but also to temporarily prolong the time for repair . p53 is a well-studied tumor suppressor and closely related to radiosensitivity in various cancers including CaP [104, 105], which is also regulated by miRNAs . Several recent publications demonstrated that miRNAs contribute to the tight control of p53 by directly interacting with the 3ʹ-UTR of TP53 mRNA, including miR-125b, miR-504, miR-33, miR-380, miR-1285, miR-25 and miR-30d . Le et al. found that IR can repress expression of miR-125b in zebrafish embryos and that this repression contributes to the radiation-induced expression of p53, leading to stress-induced apoptosis . In return, it was shown that p53 also mediates the processing and functions of miRNAs on different levels including transcription induction, processing by Drosha and Dicer, and mRNA target selection via interaction with RNA-binding-motif protein 38 in U2OS osteosarcoma and MCF-7 breast cancer cells in vitro [106, 108]. p21, one key component in the downstream of p53, is also regulated by miRNAs in cancer radioresistance, including miR-208a and miR-132/212 cluster in lung cancer [109, 110], miR-106b in colon and CaP [53, 111], let-7 in cervical cancer , miR-17-5p in oral squamous cell carcinoma . Interestingly, miR-106b was shown to be able to override radiation-induced cell cycle arrest mediated by p21, and can be used as a potential therapeutic target in LNCaP and MDA-PCa-2b CaP cells whose radioresistance is likely due to a consistently elevated level of miR-106b . Moreover, at G2/M checkpoint, it was reported that miR-95 overexpression recapitulated an aggressive phenotype including deregulated G2/M checkpoint following IR and increased invasive potential in PC-3 CaP and MDA-MB-231 breast cancer cell lines in vitro and s.c mouse models in vivo, by targeting sphingolipid phosphatase SGPP1, an antagonist of sphingosine-1-phosphate signalling , indicating that G2 to M phase transition is also subject to miRNA regulation. The roles of miRNAs as a regulator of cell cycle in cancer radiation treatment including CaP are shown in Figure 2. Failure to repair radiation-induced DNA damage triggers cell death directly or indirectly by apoptosis, mitotic catastrophe or senescence. While it is not considered as a major mode of cell death in carcinomas, apoptosis is a major defence mechanism against malignant transformation. In fact, failures in normal apoptotic pathways contribute to carcinogenesis and tumor cells use a variety of molecular mechanisms to evade apoptosis. Thus, an agent that can selectively enhance apoptotic cell death in malignant cells without affecting normal cells would be an ideal selection for cancer therapy. Not surprisingly, miRNA plays a regulatory role in apoptotic cell death. Two core pathways (the extrinsic-death receptor pathway and intrinsic-mitochondrial pathway) exist to induce cancer cell apoptosis . The extrinsic pathway is triggered mainly by binding of Fas plasma-membrane death receptor with its extracellular ligand-Fas-L. The complex of Fas/FasL then activates its pro-caspase-8, which proceeds to trigger pro-caspase-3 for execution of the apoptotic process . Gao et al. suggest that miR-467a is oncogenic in radiation-induced thymic lymphoma cells and overexpression of miR-467a may confer a growth advantage on thymic lymphoma tumor cells via ectopic expression of Fas and Bax . MiR-23a/b were found to be up-regulated in radiation-induced thymic lymphoma tissue samples, and cell death and apoptosis were increased by miR-23a/b inhibitor (antisense oligos) and decreased by miR-23a/b mimics in EL4 lymphoma cells in vitro . Knockdown of miR-155 using anti-miR155 miRCURY LNA™ probes in OCI-AML3 acute myeloid leukaemia cells resulted in an increased expression of cleaved caspase-3, leading to an activation of apoptosis cascade . In addition to miR-155, let-7a overexpression confers radioresistance to A431 human squamous carcinoma and HepG2 hepatocellular carcinoma cells in vitro . The intrinsic pathway also leads to apoptosis but under the control of mitochondrial pro-enzymes. One of the most important regulators of this pathway is the Bcl-2 family of proteins including myeloid cell leukemia1 (MCL1) and Bcl-2 itself . MCL1 is a direct target of miR-193a-3p in U251 glioblastoma and HeLa cervical cancer cells  and miR-101 in HepG2 hepatocellular carcinoma cells . Bcl-2 is a target of miR-181a which modulates radiosensitivity in human U87MG malignant glioma cells . It was also demonstrated that miR-124 was a negative regulator of MYC and Bcl-2 expression in OCI-Ly1 B-cell lymphoma cell line . Körner et al. identified protein kinase C epsilon as a novel direct target of miR-31 which was associated with increased radiosensitivity in MDA-MB-231 breast cancer cells via down-regulation of Bcl-2 . In CaP, miR-204-5p directly targeted the 3'-UTR of Bcl-2 mRNA leading to increased apoptosis in PC-3, 22Rv1 and LNCaP cell lines . In addition, both Bcl-2 and p21 were identified to be potential target genes of miR-182 in PC-3 CaP cells using TargetScan and PicTar in vitro . MiR-205 was found to promote apoptosis in PC-3 CaP cells in response to DNA damage by targeting Bcl-2 . Taken together, various miRNAs play a functional role in modulating apoptosis in different kinds of human cancers including CaP. The regulatory roles of miRNAs in apoptosis in CaP radiation response are summarized in Figure 2. An overview of roles of miRNAs as a regulator of cell cycle and apoptosis in radiation response in cancers including CaP. Following the induction of DNA damage by radiation, the reaction that initiates the G1/S or G2/M cell cycle checkpoints is phosphorylation of CHK1 and CHK2 by ATM or ATR. Cell cycle progression is then interrupted to allow time for DNA damage repair by targeting the Cyclin/CDKs complexes whereby affect other components in cell cycle including CDC25, p53 and p21, in order to achieve cell cycle arrest and apoptosis. Multiple miRNAs play important roles in up-regulating or down-regulating these biological processes. CDK, cyclin-dependent kinase; CHK, checkpoint kinase; MCL1, myeloid cell leukaemia 1; SGPP1, sphingosine-1-phosphate phosphatase 1; '⊣' indicates down-regulation and '⟶' indicates up-regulation. Autophagy is a regulated and catabolic process which plays an important part in response to IR . When uncovering relationships between autophagy and cancer, a common challenge is to determine whether autophagy protects cell survival or contributes to cell death, which remains largely unknown. Similarly, contribution of autophagy to radiation response remains elusive because of some contradicting reports. In BxPC3 and PANC-1 pancreatic cancer cells, reduced levels of the miR-23b were found to increase levels of autophagy to promote radioresistance . In line with this finding, Liao et al. found that overexpressed miR-32 reduced IR-induced cell apoptosis by enhancing autophagy in DU145 and PC-3 CaP cells , and Wang et al. found that through downregulating NDRG2, miR-301a and miR-301b could decrease autophagy of CaP cells in hypoxia and promote radioresistance . On the contrary, overexpression of miR-199a-5p was demonstrated to enhance IR-induced autophagy and sensitised cells to IR in highly invasive MDA-MB-231 breast cancer cells . Using flux analysis, Schaaf et al. assessed autophagy activity changes after IR in 8 cell lines including DU145 CaP cell line, and concluded that canonical autophagy does not contribute to cellular radioresistance . The discrepancies of the relationships among miRNAs, autophagy and tumor radioresistance may be attributed to the interaction between the promoter regions of the genes or the cell-line specific manner. Collectively, miRNAs play a double-faceted role in regulating autophagy in RT, and further comprehensive investigations are warranted. Areas of hypoxia within prostate tumors are known to be involved in radiation response . Hypoxia, in addition to a low pH and lack of nutrients, provides a favourable environment for tumor progression and the development of metastases . One of the most important hypoxia-associated proteins, hypoxia-inducible factor 1-α (HIF-1α), is a critical transcription factor involved in the adaptation of a number of different types of cancer cells, including prostate, to hypoxic conditions . The precise roles of HIF-1α in the regulation of radiosensitivity are highly complicated: there is a close interplay between HIF-1α and radiosensitivity, but the degrees of impact vary by tumor types. In non-small cell lung cancer cells, HIF-1α was up-regulated by miR-21 in RR cells, resulting in promotion of the key enzymes of glycolysis. Inhibition of HIF-1α suppressed glycolysis and re-sensitized the cancer cells to radiation, whereas the recovery of HIF-1α in RR cells resulted in recovery of radioresistance . It was recently reported that hypoxia down-regulates Drosha and Dicer in several ovarian and breast cancer cell lines and leads to dysregulation of miRNA biogenesis and increased tumor progression . Using the ovarian cancer data from the Cancer Genome Atlas project, it was also observed that higher levels of hypoxia and lower levels of Drosha and Dicer are significantly correlated with worse survival rates in ovarian cancer patients . These two observations suggest hypoxia-induced miRNA changes are highly involved in ovarian cancer progression. It is also known the down-regulation of miR-210 by antisense lentiviral vectors in hypoxic human hepatocarcinoma led to increased radiosensitivity, both in SMMC-7721, HepG2 and HuH7 cell lines in vitro  and SMMC-7721 mouse model in vivo . Further understanding of the regulatory mechanisms of miRNA in tumor hypoxia could lead to enhanced CaP radiosensitivity. EMT is characterized by the loss of adhesive features, enhanced cell motility as well as the acquisition of mesenchymal characteristics, such as invasive motility . The role of miRNA in EMT is double-sided. Recently, it was demonstrated that overexpression of miR-144 conferred significant radioresistance on MDA-MB-231 and SKBR-3 breast cancer cell lines via enhancing EMT by inhibiting E-cadherin expression and promoting Snail expression . Yoo et al. found that miR-5003-3p functioned as a metastasis activator by promoting EMT through dual regulation of Snail stability and E-cadherin . It was demonstrated that hypoxia led to enhanced EMT phenotypes associated with increased expression of miR-21 in PC-3 and LNCaP CaP cell lines . Conversely, studies from other groups gave the opposite answer. Ectopic overexpression of miR-449a in LM9 and Huh-7 hepatocellular carcinoma cell lines promoted EMT by attenuating the accumulation of Snail . Similarly, several other miRNAs, including miR-143, miR-506 and miR-156a were also found to be a negative regulator of EMT by targeting a diverse range of sites in esophageal, nasopharyngeal and cervical cancers, respectively [147, 148, 149]. Our preliminary data showed that forced expression of either miR-200a-5p or miR-4474-3p using miRNA mimics could reverse EMT in PC-3RR CaP cell line (unpublished data). Collectively, whether miRNA promotes or represses EMT remains elusive and is largely in a miRNA- and cell type-specific fashion and further investigation is needed to facilitate the development of novel miRNA-based anti-tumor strategies for personalised medicine. In the last decade, CSC theory has offered an explanation for tumor relapse and therapeutic resistance, and CSCs are closely associated with radiosensitivity in CaP via multiple mechanisms, which has recently been reviewed . However, to date, there is no review that systemically discusses the regulatory role of miRNA in CSC-related radioresistance. Recently, the basis of radioresistance was attributed to CSCs which contain lower reactive oxygen species (ROS) and enhanced ROS defences therefore suffer from less DNA damage . A limited number of experiments showed that miRNAs are involved in modulating radioresistance via CSCs. For example, CSC marker genes such as Nanog, Oct4 and EZH2 were found to be increased concurrently with the expression of miR-21 in PC-3 and LNCaP CaP cells under hypoxia . Rane et al. demonstrated that low expression of miR-99a and miR-100 is present in prostate cancer stem cell (PCSC) populations which are relatively radiation insensitive . Strikingly, Rane's group examined 11 randomly selected miRNAs in a CSC phenotype CD133+α2β1hi subpopulation enriched from CaP tissue, and discovered that miRNA expression profile is predominantly dependent on the differentiation stage and can be possibly used to stratify CaP-stem-like cells and CRPC-stem-like cells. The regulation of miRNAs with CSCs in CaP radioresistance is a very interesting research area, and needs to be thoroughly investigated for developing innovative therapies to overcome CaP radioresistance. The miRNAs involved in regulating radiosensitivity in CaP are summarized in Table 2. The discoveries identified a key regulatory role of miRNAs in various biological processes of CaP cells in response to IR, highlighting the opportunity to develop therapeutic targets aimed at these processes to treat CaP. It is clear that miRNAs are actively involved in tumorigenesis and treatment responses, and mounting data suggest that they may serve as promising diagnostic and prognostic biomarkers in cancer treatment , including CaP . Recently, Montani et al. performed a large-scale and comprehensive validation study of the miR-Test based on serum miRNAs in high-risk individuals (n=1115) enrolled in the Continuous Observation of Smoking Subjects (COSMOS) lung cancer screening program. The overall accuracy, sensitivity, and specificity of the miR-Test are 74.9% (95% confidence interval [CI] = 72.2% to 77.6%), 77.8% (95% CI = 64.2% to 91.4%), and 74.8% (95% CI = 72.1% to 77.5%), respectively . These striking results support that the miR-based test might be a useful tool for cancer screening in high-risk individuals. Another interesting study conducted by Hur et al. measured the miRNA profile of colorectal cancer patients in primary tumor tissues compared to the matched liver metastases tissues, and identified 23 differentially-expressed miRNAs . Four miRNAs that were down-regulated in liver metastases (let-7i, miR-10b, miR-221, and miR-320a) were further validated in primary colorectal tissues and it was found that let-7i expression was statistically significantly reduced, and miR-10b increased in the primary colorectal cancer patients who suffered synchronous distant metastases compared with patients who did not, while miR-221 and miR-320a were non-statistically correlated . These unique miRNAs may be clinically applicable to predict prognosis and distant metastasis in colorectal cancer. In CaP, more than 40 studies performed in investigating miRNAs in whole-blood samples including serum, plasma, peripheral mononuclear cells, exosomes and urine have been published, which was recently reviewed by Fendler et al. . From the analysis, it was found the heterogeneity of the disease, differences in population size and study design and disparity in the statistical analysis contribute to the controversial results among the studies. Also, most of the reports identified various miRNA signatures as biomarkers for CaP diagnosis, positive biopsy results and prognosis, with none as biomarkers for the RT response in CaP treatment. The investigation of feasibility and efficacy of miRNAs in clinics for the treatment of CaP is still largely in its infancy. With the controversial PSA-based screening, overdiagnosis and overtreatment have become a major problem in the management of CaP . To alleviate these negative effects, active surveillance (AS) was recently advocated to delay any kind of curative local therapy until the natural history and cancer threat can be more accurately characterized. The selection of AS candidates combines PSA level, Gleason score, clinical stage, life expectancy and percent biopsy involvement . However, even when these criteria are strictly used, misclassification rates are still around 20% or higher, remaining as a limitation to the accurate identification of low-risk CaP patients . Wang et al. showed that pre-surgical serum levels of miR-19, miR-345 and miR-519c-5p could help identify adverse pathology in CaP patients eligible for AS, independent of their pre-surgical age, PSA, stage, or percent biopsy involvement , suggesting that miRNAs can be used as a new way to better select AS candidates in CaP patients. Abbreviations: CSA, Cockayne syndrome protein A; CSC, cancer stem cell; DAB2IP, DAB2 interacting protein; DNMT3B, DNA methyltransferase 3 beta; EMT, epithelial-mesenchymal transition; MAD2L2, mitotic arrest deficient-like 2; RAD23B, RAD23 homolog B; SGPP1, sphingosine-1-phosphate phosphatase 1; SMARCA5, SWI/SNF related, matrix associated, actin dependent regulator of chromatin, subfamily a, member 5; SMARCD1, SWI/SNF related, matrix associated, actin dependent regulator of chromatin, subfamily d, member 1. Preliminary data from Gonzales et al. demonstrated a strong correlation between miR-141 levels and chemotherapy response in CaP patients; thus, it could be potentially used as a useful tool for evaluating prognosis or treatment efficacy of CaP. Perhaps, the full utility of miR-141 could be in a combinatorial, multivariate panel with other validated markers such as PSA, circulating tumor cells (CTC) and lactate dehydrogenase (LDH) . There is also one active clinical trial (clinicaltrial.gov identifier: NCT02366494) aiming to identify exosomal miRNAs that predict response to androgen deprivation therapy (ADT) from peripheral blood of CaP patients with systemic disease using next generation sequencing. In terms of CaP RT, the lack of effective and accurate biomarkers that predict the presence of, or the potential leading to radioresistance in patients, remains a barrier in optimizing treatment strategies. The miRNA profiles identified in patients' body fluids hold promise for prediction of disease stage and treatment response to achieve proper stratification of patients. Gade et al. fused patient tissue-based mRNA and miRNA expression data into one prediction model and improved clinical outcome prediction in 98 CaP patients . Santos et al. found that patients diagnosed with high-Gleason score tumors and higher expression levels of miR-221 have an early CRPC compared to patients with lower miR-221 expression levels (10 vs. 46 months, log-rank test P = 0.012) and observed a significantly lower overall survival in patients with higher peripheral whole-blood expression levels of miR-7 (28 vs. 116 months, log-rank test P = 0.001) . For the first time, Cheng et al. raised the possibility that serum miR-210 levels could be used to identify a biologically distinct, subset of metastatic CRPC patients for whom the development of alternative therapeutic approaches could be considered . It would be of great value to develop a miRNA signature which is capable of predicting radiation treatment response, to achieve personalised therapy. In radiation research, several miRNAs have been used as a biomarker to minimize the acute and latent radiation-related toxicity. MiR-150, abundant in lymphocytes, exhibited a dose- and time-dependent decrease in serum, which was proposed as a sensitive marker indicative of lymphocyte depletion and bone marrow damage during and after RT . Someya et al. identified a good correlation between the post-RT rectal bleeding and the combination of low Ku80 expression and high miR-99a expression in peripheral blood lymphocytes for CaP patients, suggesting that miRNAs, combined with other biomarkers, could form a promising panel for predicting rectal bleeding after RT in CaP . Fendler et al. developed a classifier based on two serum miRNAs (miR-30a and miR-126) that can reproducibly predict radiation-induced mortality in radiation-exposed macaques . Hamama et al. also reported the overexpression of miR-210 in intestinal samples obtained from patients with radiation enteropathy and fibrotic cultured cells , suggesting that miRNAs could serve as an indicator of radiation injury. In the perspective study, detecting miRNA profiles from human bio-fluids such as blood or urine could be useful for predicting radiation response pre-RT and monitoring cancer recurrence after RT in CaP patients. Numerous preliminary studies have shown a promising future of miRNA-based application in cancer treatment. As miRNAs play an oncogenic or tumor suppressive role in cancer progression and therapeutic resistance, multiple strategies have been employed to target miRNAs in current cancer treatment. These modern treatment approaches include the use of small molecule inhibitors, miRNA vectors, miRNA mimics, miRNA sponges, the clustered regularly interspaced short palindromic repeat (CRISPR)-Cas9 technology, antisense oligonucleotides and miR-mask oligonucleotides . Forced expression of miRNA can be achieved with delivery of miRNA into cells using viral based vectors such as retroviruses, lentiviruses, and adenoviruses or adeno-associated viruses . Alternatively, non-viral delivery systems, such as physical and chemical approaches, have also been utilized in delivering miRNA [171, 172]. The advantages of non-viral systems are less toxicity, less immunogenicity, and no limitation on the size of the transferred miRNA. The disadvantages are lower transfection efficiency, worse biodegradability and shorter half-lives, largely limiting the use in in vivo studies [173, 174]. MRX34 is a liposomal miR-34a mimic, and recent results from the first in-human, phase I study which assessed the maximum tolerated dose (MTD), safety, pharmacokinetics, and clinical activity of MRX34 in patients with advanced solid tumors showed that MRX34 treatment (by intravenous infusion twice a week for 3 weeks followed by 1 week of rest) with dexamethasone premedication was associated with acceptable safety and showed evidence of antitumor activity in a subset of patients with refractory advanced solid tumors . It was also found that intratumoral delivery of miR-890 mimetics prior to IR therapy significantly enhanced IR (6Gy, single dose) therapeutic efficacy in a DU145 subcutaneous (s.c) CaP mouse model in vivo . Aptamers, as chemical antibodies that bind to targets with high affinity and specificity, are a novel agent for both cancer diagnostic and therapeutic applications . After conjugated with an aptamer, the miRNA can be specifically delivered to its target that expresses proteins recognized by the aptamer. Esposito et al. engineered a multifunctional aptamer-miRNA conjugate by linking a tumor suppressor let-7g to an aptamer that specifically antagonizes the oncogenic receptor tyrosine kinase Axl, and this conjugate demonstrated tumor-growth inhibiting capacity in A549 lung cancer cells in vitro and in a s.c mouse model in vivo . Similarly, intratumoral injection of miRNA mimics may prove beneficial in controlling tumor growth, for example, reconstitution of miR-15a and miR-16-1 expression results in growth arrest, apoptosis and marked regression of LNCaP CaP orthotopic xenografts in vivo . On the other hand, miRNAs down-regulation or inhibition can be achieved by using miRNA sponges which equipped with multiple miRNA binding sites targeting endogenous miRNAs, decreasing the expression level of targeted miRNA . Alternatively, the latest CRISPR-Cas9 technology could modify miRNA genes, thereby up-regulating or down-regulating the transcription of miRNAs . Therefore, once the potential miRNAs associated with CaP radiosensitivity are identified, all above-mentioned miRNA-targeting techniques available could be exploited for developing targeted therapy or combination therapy to sensitize the tumor cells to radiation in order to reduce the radiation dosage and radiation-related toxicity, leading to an improvement of the overall effect of RT. Although the miRNA-based therapies have made great progress in cancer preclinical studies, the implementation of these techniques in reality is facing with many challenges. First, as mentioned before, there are great variations in the expression of miRNAs among different human cancer types, even among studies of the same tumor type from different research groups. Second, tumor microenvironment plays an essential role in regulating tumor biological behaviour and may confound the identification of miRNA expression. Third, tumor progression during treatment is a dynamic process accompanied with dynamic miRNA expression. Therefore, further technical and scientific development and thorough clinical investigation are warranted to overcome these challenges. The regulatory roles and mechanisms of miRNAs in radioresistance have been a hot topic in the cancer research for the past decade. The expression of miRNAs is regulated by radiation, and in turn, altered miRNAs play an important role in changing radiation sensitivity via multiple cellular signalling pathways as well as a diverse range of biological processes. Currently, most data on the regulation of miRNAs in CaP radiation research are limited to in vitro cell line study. Their actual role in modulating radiosensitivity in CaP needs to be properly and further defined in in vivo models such as patient-derived xenografts (PDX) as well as in human RR CaP tissues such as patient-derived explant (ex-vivo) model. Additional data validating the diagnostic, prognostic and therapeutic values of miRNA in human samples from CaP patients with RT are much needed over the next few years, which will further strengthen the enthusiasm for this new class of anticancer agents. miRNAs are important biomarkers for predicting CaP radiation response and need to be investigated in human RR CaP samples. Targeting miRNAs using current miRNA-based techniques combined with RT holds promise for overcoming CaP radioresistance. A deeper understanding of the role of miRNAs in cancer radioresistance will not only provide new insights for radiation oncology but also achieve personalized cancer treatment and bring new hope to the CaP patients. 3D: three-dimensional; 3D-CRT: three-dimensional conformal radiation therapy; ADT: androgen deprivation therapy; AR: androgen receptor; AS: active surveillance; ATM: ataxia telangiectasia mutated; ATR: ataxia telangiectasia and Rad3-related protein; BPH: benign prostatic hyperplasia; CaP: prostate cancer; CDK: Cyclin-dependent kinases; CHK: checkpoint kinase; COSMOS: continuous observation of smoking subjects; CRISPR: clustered regularly interspaced short palindromic repeat; CRPC: castration-resistant prostate cancer; CSA: Cockayne syndrome protein A; CSC: cancer stem cell; CTC: circulating tumor cells; DDR: DNA damage response; DNA-PK: DNA-dependent protein kinase; DSB: double-strand break; EBRT: external beam radiation therapy; EMT: epithelial-mesenchymal transition; ERK: extracellular signal-regulated kinase; HIF-1α: hypoxia-inducible factor 1-α; HR: homologous recombination; IMRT: intensity modulated radiation therapy; IR: ionizing radiation; LDH: lactate dehydrogenase; MCL1: myeloid cell leukemia1; miRNA: microRNA; MTD: maximum tolerated dose; NHEJ: non-homologous end-joining; PARP-1: poly [ADP-ribose] polymerase-1; PCSC: prostate cancer stem cell; PDX: patient-derived xenografts; PFS: progress-free survival; PTEN: phosphatase and tensin homolog; RR: radioresistant; RT: radiotherapy; s.c: subcutaneous; SSB: single-strand break. Our prostate cancer radiation research project is partly supported by the St George Cancer Care Cancer Research Trust Fund and the Prostate and Breast Cancer Foundation.